Board index On the track Planning a trip? The Whangamomona Republic day is on 24th Jan 09. Its a great day out with lots of fun to be had. What im planning is going in on Friday night, and stay at camp, republic day on Saturday and a Kiwi 4x4 run on the Sunday. This is not to be missed and will be remembered by all that come. 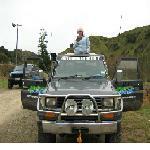 madaz068 wrote: The Whangamomona Republic day is on 24th Jan 09. Its a great day out with lots of fun to be had. Will it actually be roadworthy by then??? Yep, pencil me in as usual............f@%k work!!! 92 swb Pajero ute. 3 litre V6 manual. 33" Mud wranglers, Diff breathers, Snorkle, 9500lbs electric winch, Rear diff lock, CB & PRS radio's. Just give rhys the truck for parts ants you dont need it, just bring the banana truck to cook out of! That's starting to sound like a catch phrase! Starting to sound like work is more important than 4x4ing You need to sort them out Pinky blouse Tony. I am going up for the Whanga Republic day as an 'individual'. Will be doing our normal thing and going up on the Friday arvo. So who else is a definite starter, and do you's want to meet at Sanson like we usually do and convoy up?? This is now only 4 weeks away. Who else is coming? You still coming Jerry, fj40???? You & Suz are coming up for this aren't you Dace?